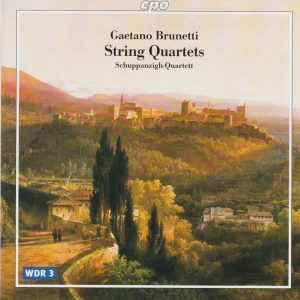 I had been bowled over by the three symphonies of Brunetti recorded by Concerto Köln on Capriccio, which I found hugely exciting and quite original, not indebted to the formal models in vogue in the main centers of Europe in the 1770s to 1790s, and they suggested that the Spaniard of Italian descent Gaetano Brunetti (1744-1798) may be your major unknown composer of the classical era. But then I was disappointed by the Bassoon Quintets on Tactus, which didn’t live up to my hopes: charming music in its galant style, to be sure, but offering little beyond the galant salon style. 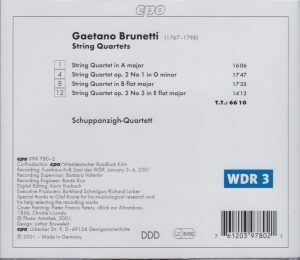 While perhaps not generating as much excitement as the Symphonies, I’m happy to report that the four string quartets recorded in 2001 by the Schuppanzigh-Quartett for Cpo have offered many rewards. Certainly, the music has little of the emotional turmoil associated to “Sturm & Drang” or pre-romanticism. When it is present, as in the first movement of op. 2-1 (track 4), it is in short episodes immediately contrasted with lighter moods. But within their mostly merry, galant and charming style, the quartets offers many ear-catching surprises, great instrumental verve and an irresistible joy of music-making. The Andantinos, Larghettos and Largos are more about elegance and emotional restraint than about heart-on-sleeve outpouring of torment, but there’s always a turn of phrase, an instrumental figuration, a flight of fancy to catch the ear. The Finales teem with bubbling energy and boisterousness. Among the many moments that capture attention, one can mention the merry instrumental dialoguing in the first movement of the A major Quartet (track 1), the sweet surges, almost lullaby-like, of first violin against a background of robust playing in the opening Allegro of the B flat major Quartet (track 8), the inventive variations of the same (track 9) or the “Allegro di molto” Finale of Quartet op. 2 No. 3 (track 15) with its buzzing sul ponticello first violin and racing dance-like dynamism, and sudden outbursts of energy. So far as it can be established, the four quartets featured here stem from different periods in Brunetti’s life: the early 1770s in those from Opus 2, 1789 for the A major (the fourth in a series of six “composed for the King’s entertainment” – that’s King Carlos IV of Spain), 1792 for the B flat major, which may have been Brunetti’s last composition in the genre. For the anecdote, the erudite liner notes were contributed by an Olaf Krone, who, back in 2001, seemed to have done a lot of research on Brunetti (“the largest categories within his chamber oeuvre are the violin sonatas, sixty string quintets, and over fifty string quartets, thirty-four of which the author of these lines has been able to track down“). The CD’s credits referred to his “Gaetano Brunetti – A Thematic Catalogue of his works (publication in preparation)”. Well, he must have been like the proverbial hare, because he seems to have been beaten on the finishing line by the Spanish musicologist Germán Labrador López de Azcona, who in 2005 published the summum opus of a critical, thematic and chronological catalog of Brunetti’s works (see here for a outside review – link will open a new tab to another website). What became of Olaf Krone and his catalog thereafter is unclear. The internet yields very little information on him, but he seems to be a non-professional musicologist (no impediment in itself to doing fine musicological research) and a computer person (“Informatiker”) by trade, and an occasional writer in the German magazine for early music Concerto. In 2006 he was involved in a controversy, for passing off, due to lack of serious research, for a unknown Requiem of Michael Haydn one that had been in fact composed by Georg von Pasterwitz and only (partly) copied by Haydn. If you read German you’ll find more on this here. Not that this has any bearing on the enjoyment of the music, and in fact, whatever his musicological credentials, one must be greateful to Mr Krone for masterminding the resurrection of these quartets. When one listens to minor, obscure or forgotten composers of the past (although they may have been very popular during their lifetime), those that posterity has rejected or neglected in favor of the few “giants” of the era, there is always an underlying quest beyond the pleasures, small or big, offered by the music: to try and assess what it is that makes these few “great” composers – Mozart and Haydn for the classical era – the giants that future generations have recognized, as opposed to the lesser composers – or, conversely, to try and locate what is missing in the compositions of those lesser composers, for them to have been recognized as greats for the ages to come. But, with the music of Brunetti here as with all those other minor composers, I rapidly find myself unconcerned by those hair-splitting comparisons. I’d have to spend many hours jumping from the quartets of Mozart and Haydn to those of Brunetti or Dittersdorf to try and really analyze “the thing” – but then, why bother? I’m just happy to say that, while I am listening to the quartets of Brunetti, they seem as fine as those of Haydn and Mozart, and offer sufficient pleasures for any comparison to seem entirely vain. The Schuppanzigh Quartet plays on period instruments but I don’t particulary hear anything that sounds “period”. It may be that I’m deaf, or unconcerned. Fanfare critic Barry Brenesal was particularly damning in Fanfare 25:6 (July-August 2002) on their playing style (“Their sound is wiry, and the bass, attenuated—not, I suspect, by engineering design, but because the cellist plays most of his part in a soft, flat tone that contributes next to nothing in most ensemble passages. The four musicians hit nearly every note very softly and then swell the results, causing difficulty in perceiving both the beginning of phrases, and the individual entries of various parts. Dynamics are restricted. Figuration (as in the second movement of the String Quartet in A) is sometimes clear and well defined, sometimes skimmed across the top of the strings, making no effect whatsoever”). You are warned, then, but I hear, or am bothered by, nothing that he describes. TT 66 minutes. See my Brunetti composer entry for more discographic leads.